We will celebrate our Grand Opening on Saturday, January 22. We will have specials all day on winemaking and cheesemaking items, as well as various cheeses to taste from Venissimo to inspire your next cheesemaking endeavor. We will also have a very special guest instructor, Gina "the Cheese Wiz" Freize from Venissimo, for a free cheesemaking demonstration. Come down and check it out! There are many ways to easily incorporate recycling into your winemaking. One of the best -- and most rewarding for you -- is to recycle your own wine bottles to refill with your very own wine! Save up a few cases of wine to recycle all at once, then just soak the bottles in water (warm is better but not required) with a few sprinkles of EasyClean or a drop of liquid dish detergent. You can either soak the bottles in one side of your sink, or in a bucket or even a small (clean) trash can. Let the bottles soak 20 minutes to an hour, then the labels should come off relatively easily. Some labels come off as one piece, though more often they come off in bits. I have found that you can pretty easily scrub soaked labels off of a bottle with a green scotch pad. If the label does not come off easily, though, it is often not worth the effort to try to get it off -- recycle that bottle with the cardboard and foil. While corks can't be recycled back into a filled bottle of wine, there are lots of other uses for used corks. They can of course be used to recork an opened bottle of wine. They can also be used to protect the sharp ends of various instruments such as meat forks or small knives in a drawer. You can also slice the corks to make cushion pads to glue onto ceramics or other objects that scratch tables or floors when they are moved. There are also many creative uses for corks, such as making ornaments, trivets, or wreaths. There are some really interesting ideas on this post. You can also bring your used wine corks (no plastic corks please!) to Curds and Wine and drop off in the ReCork recycling box. ReCork takes used wine corks and makes them in to new useful items, such as flooring and shoes. Curds and Wine is just one of many drop off locations in the San Diego area. If you use oak cubes, chips, or staves in your wines, save them after you are done using them in your wine! You can use it on your grill for smoking meats or vegetables. Cubes are easier to reuse than oak chips, although those can be wrapped in a foil packet for smoking on the grill. You can even recycle your wine: if you don't finish it, or have wine that just isn't that great (or maybe too young? ), turn it into vinegar. Homemade vinegar is amazing! Look for a cloudy bottle of red or white wine vinegar at the grocery store, or buy vinegar at a farmer's market and ask them if they have any bottles with "mother" in it. Then, pour your wine and the cloudy vinegar into another clean vessel, such as a one-gallon jug or recycled jug wine bottle. Then cover the top with cheesecloth secured with a rubber band, and swirl to combine. Keep your vinegar in a cool, dark place for several months, swirling occasionally. After a few months, give it a taste to see if it tastes like you want. If not, keep it longer. You can also keep adding fresh wine to the vinegar stock over a long time period, to continuously make vinegar. Just take out a few small jars or bottles when it tastes like you like it, so you have finished vinegar ready to use. Be careful to keep your living vinegar away from any wine in progress -- acetobacter (the bacteria responsible for converting alcohol to acetic acid, AKA vinegar) spreads easily through the air, so you might end up with more vinegar than you planned on! There are also many ways to incorporate recycling into your cheesemaking. Good quality cheesecloth can be reused many, many times. Just soak in COLD water and wash with a little bit of soap and rinse well with more cold water. Hang to air dry, then boil before using again. You can even throw your used, lightly rinsed cheesecloth into laundry! You can also reuse cheese wax. Save it after consuming your cheeses (or even store-bought), then melt it down and strain it through coarse cheesecloth to reuse. Leftover whey can be used many ways, too. Most whey can be reboiled to make ricotta, so you get 2 cheeses out of one batch. Whey is also great to use in soups & bread, or just drink for minerals & nutrients. Alternatively, add to compost or directly water plants with it for added nutrition. You can also use whey for pickling vegetables, an ancient technique. The lactic acid in the whey, as well as a few leftover bacteria, will preserve vegetables and produce a much more mild pickle than using vinegar. Do you have any other recycling ideas related to winemaking or cheesemaking? Post them on our Facebook page! Entering a homemade wine competition has many benefits. It inspires you to strive to make an even more outstanding wine. You get great feedback about your wine from the judges to help you tweak your winemaking skills. And, if you attend the awards ceremonies, you get to interact with fellow winemakers and taste a broad range of outstanding homemade wines. Many of the wine kits we carry at Curds and Wine have consistently won Gold and Silver medals at wine competitions around the world -- the next medal could go to you! Winemaker magazine's Dec/Jan issue has several great articles about entering your first competition and winning, and there is great advice from Tim Vandergrift to perfect your wine kit making techniques in the "Guide to Wine Kits" -- both of these are available in the shop now! Another way to improve your winemaking skills and techniques is to attend the Winemaker Magazine conference in Santa Barbara, CA this year. The conference is May 20-21, and if you register before March 1 you save $100 on registration fees. Register early, as this conference has sold out the past 3 years! There are several amazing seminars and workshops at this conference specifically about kit winemaking, as well as making wine from fresh/frozen grapes and even vineyard management. It's also a great place to meet winemakers at every level, and get new insights and perspectives of winemaking. Upcoming competitions include the 2011 Winemaker magazine International Amateur Wine Competition. Entries are due by March 4, 2011, and entry forms are available at the shop or online. If you are shipping your wine to a competition, be sure to pack it well so the bottle doesn't break; we have the Bottle Bubble available to help package your wine for shipment. There also are several local competitions including the Orange County Fair in June and the San Diego county fair in July. Wines are submitted a few weeks before the Fair opens, so make your wines now so they’re ready for judging by then. The best part of entering the San Diego County Fair wine competition is that you get 2 complimentary tickets to the Fair AND access to the awards ceremony, where you can meet the other contestants and get to try everyone’s wines! It’s a great time, lots of fun, food, and wine. 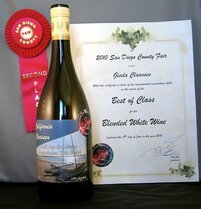 I won a silver medal and Best of Class in 2010 with a white kit wine, and several other medal-winning entries were wine kits as well. We will keep you informed about contest deadlines and other upcoming wine competitions as they approach. If you know of any contests, please let us know! 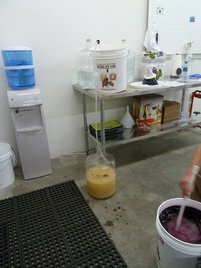 Join us to see just how easy it is to make your own wine, at home or on site at Curds and Wine! We will go through all of the basic steps of making wine from kits, from start to bottle. This will be an interactive demonstration, you will have an opportunity to take part in winemaking steps hands-on. This demonstration will take about an hour, and then you can start your own wine! There is no charge, and you will get 10% off of any wine kit if you purchase one following the demonstration. Discover how easy and rewarding it is to make your very own wines! The first of the Limited Edition wine kits will be released this month! Those include 2 from Winexpert: Australian Shiraz/Viognier and Pacifica White Blend and Grenache Quartet from Cellar Craft. If you forgot to sign up for these kits, there are a few extra ordered, but they will be sold on a first-come first-served basis. If you are interested, please contact me electronically or call me at the store to check availability. We would like to thank all of our customers for their patronage and support in our opening year. Best wishes to everyone for a very happy and fruitful 2011!